This is a very simple recipe with a simple cooking method, which is healthy and easy to make as a side dish for a Carb meal. The taste is very distinct and am sure you all will love to make again and again. Enjoy cooking this dish !!!!! Keep a sauce pan on stove with enough water to boil. Add the washed and trimmed beans into the boiling water. Leave the water to boil for 2-3 minutes until the beans are sufficiently cooked, making sure they are not over cooked. Strain the beans into a bowl of cold water. This helps the beans to retain the green colour even after the cooking process. Strain the beans from the water after 3 minutes. Into a bowl, add all the other ingredients and mix well. Heat the butter and the olive oil in a sauce pan until the butter is melted well and pour this hot olive oil and butter mix into the bowl of onion mix and mix well so that the onion mix get sufficiently tempered. Add the beans into the bowl and mix well with the tempered mix. 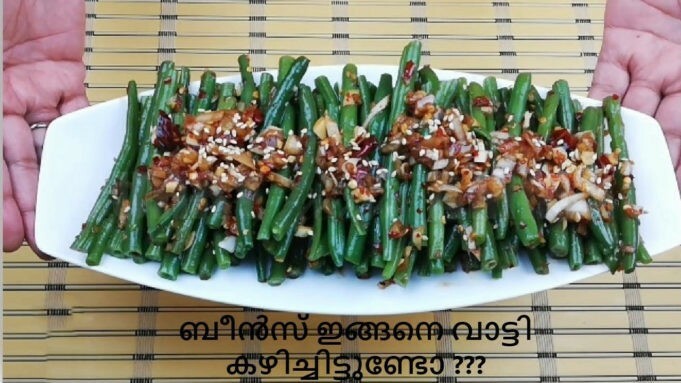 Now arrange the beans in a plate as shown in the video to make the dish more appealing and pour the onion mix with the olive oil and butter on top of the beans. Garnish with the sesame seeds on top and serve hot.